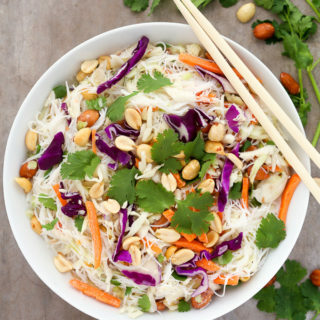 This Thai Noodle Salad with Coconut-Lime Dressing recipe is light, refreshing and infused with fragrant Thai flavors. It is naturally gluten-free, vegan-adaptable and ready to eat in just 7 minutes! 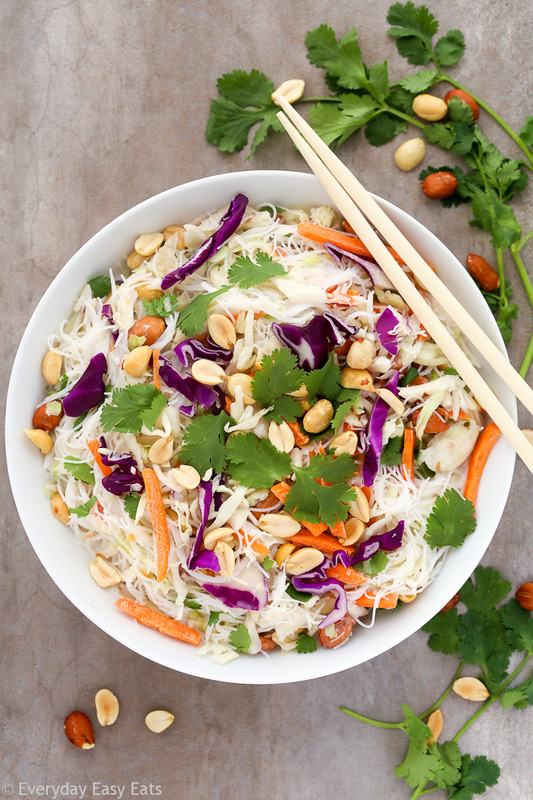 This quick cold noodle salad is made with tender rice noodles, crunchy shredded cabbage and carrots, roasted peanuts and fresh cilantro, tossed in a creamy coconut milk-based dressing. 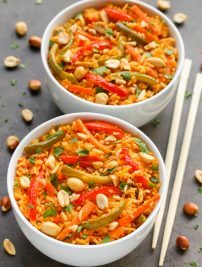 This recipe makes a perfect meal for warm weather, so it is a great dish for spring and summer potlucks and gatherings. This recipe is made using prepared coleslaw mix, which cuts down on prep time. That means this is an ideal recipe for unexpected guests, because you can throw this salad together at a moment’s notice! The noodles in this recipe are vermicelli rice noodles, which are very thin rice noodles. You can find them in the international foods section of the grocery store or online. Important: Be careful not to let the noodles cook longer than a few minutes, because they will get mushy if they overcook. Once the noodles are done cooking, rinse them immediately with cold water to stop the cooking process. Then you can cut them with scissors or break them up with your fingers, to make the salad easier to toss. Switch-ins: If you are vegetarian or vegan, use soy sauce instead of the fish sauce. Other fresh herbs, such as basil, mint or parsley may be substituted for cilantro. Glass Mixing Bowls – This set is perfect for mixing up and serving salads. I love these bowls because they are super affordable and the quality is excellent. If you make this Thai Noodle Salad with Coconut-Lime Dressing recipe, let me know! Rate it and leave a comment below, because I love hearing from you! This Thai Noodle Salad with Coconut-Lime Dressing is light, refreshing and infused with fragrant Thai flavors. Ready to eat in just 7 minutes! In a large bowl, whisk together the coconut milk, lime juice, brown sugar, fish sauce, sesame oil and ginger. Set aside. Place the rice noodles into a large pot of boiling water, cover and turn off the heat. Cook for 2 - 3 minutes, then drain and rinse the noodles with cold water. Add the cooked noodles, coleslaw mix, peanuts and cilantro to the coconut-lime dressing. Toss to combine. Serve immediately. To make this recipe vegan, substitute the fish sauce with soy sauce. Such a vibrant, delicious looking salad! These are some of my favourite flavours. Can’t wait to try it.